Mouse BMDMs and human THP1 cells were treated with LPS (200 ng/ml) in the absence or presence of indicated AMPK activators (metformin, quercetin, resveratrol, AICAR, A-769662, and salicylate), AMPK inhibitors (compound C, WZ4003, and HTH-01-015), or HMGB1 inhibitor (glycyrrhizin) for 24 h. HMGB1 release in cell medium was assayed using ELISA kit, respectively (n = 3, *p < .05 versus LPS or Escherichia coli group). (A) Cells were pre-treated with 10 ng/ml TGF-β for 24 h, then 5 mM metformin and/or 1 uM (μM) dorsomorphin were added to the medium for another 24 h. Immunofluorescence staining showed that AMPK inhibition abolished metformin's effect of decreasing TGF-β-induced α-actin expression in HFL-1 cells. The nucleus were stained with 4', 6-diamidino-2-phenylindole in the merged images. Scale bars: 150 μm. (E) LDLR blocks the translocation of ALDH2 even AMPK activation. Scale bars: 5 μm. a set of RNAi-resistant rescue forms of Cdc37 plasmids were transfected into stable Cdc37-RNAi HCT116 cells. 24 h after transfection cells were treated with phenformin and then subjected to FLAG immunoprecipitation. Adenosine 5'-monophosphate monohydrate (5'-AMP) is an activator of a class of protein kinases known as AMP-activated protein kinase (AMPK). MK-3903 is a potent and selective AMPK activator with an EC50 of 8 nM for α1 β1 γ1 subunit. It activates 10 of the 12 pAMPK complexes with EC50 values in the range of 8-40 nM and maximal activation >50%. EX229 (compound 991) is a potent AMPK activator that is 5-10-fold more potent than A769662 in activating AMPK. Ligustroflavone, isolated from the leaves of Turpinia montana, shows high antioxidant capacity and is reported to be an AMPK activator. PF-06409577 is orally bioavailable AMPK activator with EC50 of 7 nM for α1β1γ1 in the TR-FRET assay and it shows no detectable inhibition of hERG in a patch-clamp assay (100 μM) and was not an inhibitor (IC50 > 100 μM) of the microsomal activities of major human cytochrome P450 isoforms. 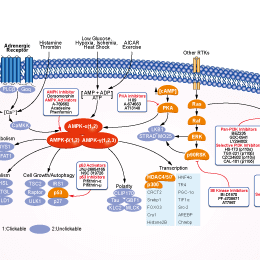 GSK621 is a specific and potent AMPK activator. Human glioma U87MG cells (A-C) and U251MG cells (D), as well as HCN-1a neuronal cells (D) or primary human astrocytes (“Astrocytes”, D) were either left untreated (“C”) or treated with applied concentrations of GSK621 for indicated periods of time, cell survival was tested by MTT assay (A and D) and clonogenicity assay (B); Cell death was also tested by the trypan blue staining assay (C). Experiments in this figure were repeated four times, and similar results were obtained. Data were presented as mean ± SD. * p <0.05 vs. “C”.